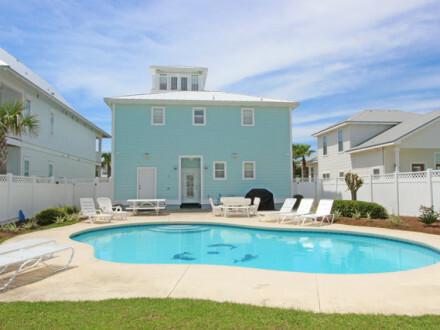 Escape to paradise at Summer Lovin’ in this luxury 4 bedroom, 4.5 bath vacation rental in Destin that sleeps 15. 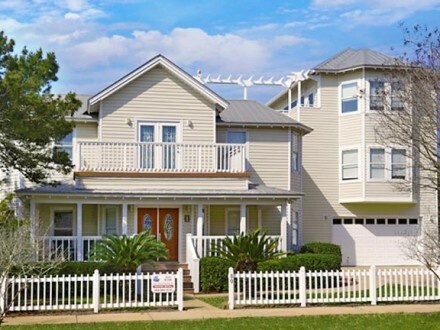 The home is nestled in the sought-after gated community of Dunes of Destin. 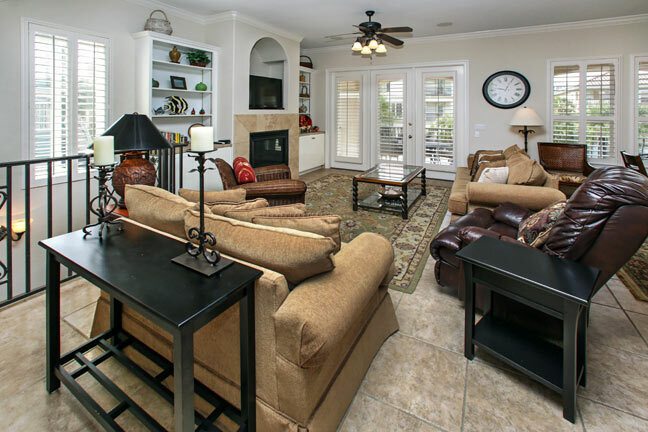 Indulge yourself in this homes spacious open floor plan, fully stocked kitchen, fireplace, wireless internet, two wet bars, natural gas grill and extravagant 3rd floor master suite with private balcony facing the Gulf of Mexico. 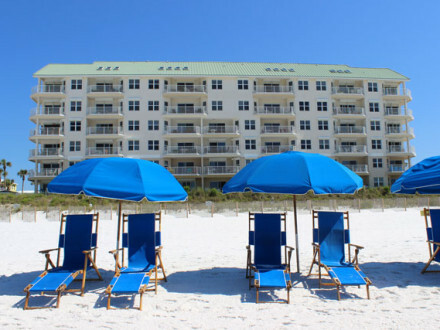 This home also offers sunlit rooms with high ceilings, cool tile floors, and plush furnishings to unwind in after a day on the sugar white beaches of Destin. The first floor of this home has a welcoming entrance with a small seating area and entertainment center. 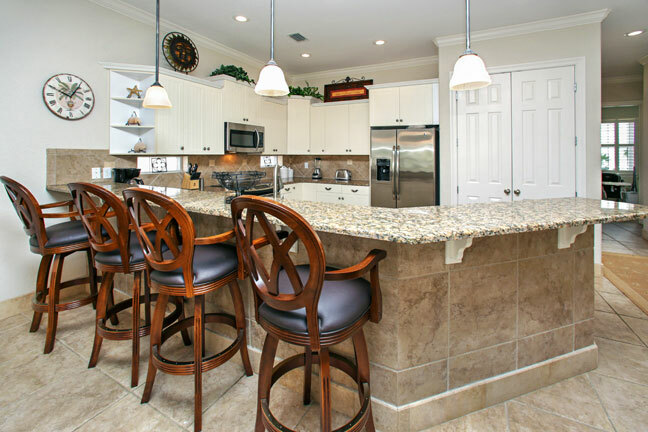 A wet bar is smartly concealed behind double doors and featuring a small fridge, sink, microwave, cabinet and counter space, and dish ware. The entertainment center is equipped with a flat screen TV with satellite service. The hallway than leads you too two bedrooms. 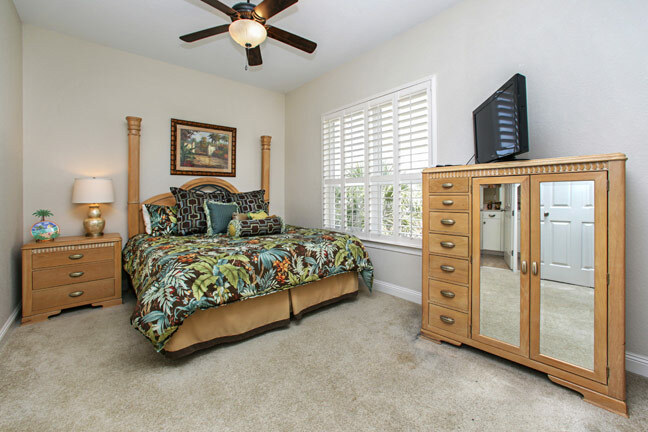 One guest bedroom has two full-sized beds, flat screen TV and a private full bathroom. 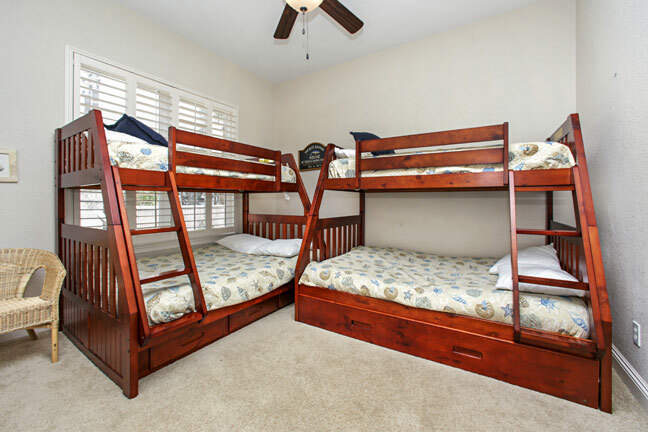 The other bedroom contains two sets of bunk beds, with twin beds over full beds. This bedroom also has a flat screen TV, Sony PlayStation2 and private bathroom. 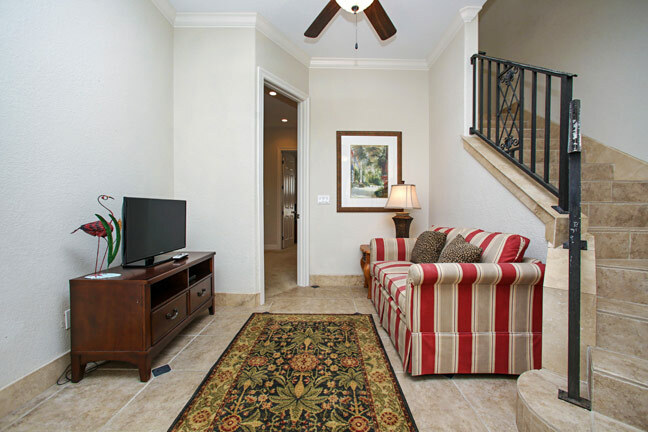 The second floor is your main living area and accessed from the travertine tile staircase. 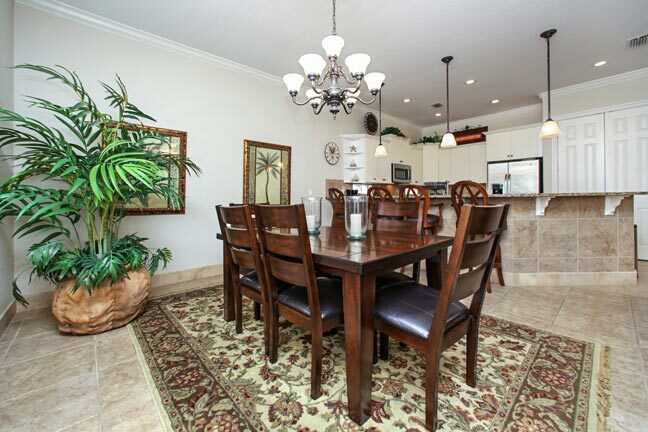 High ceilings and beautiful furnishings create the perfect open atmosphere for spending time with family and friends. 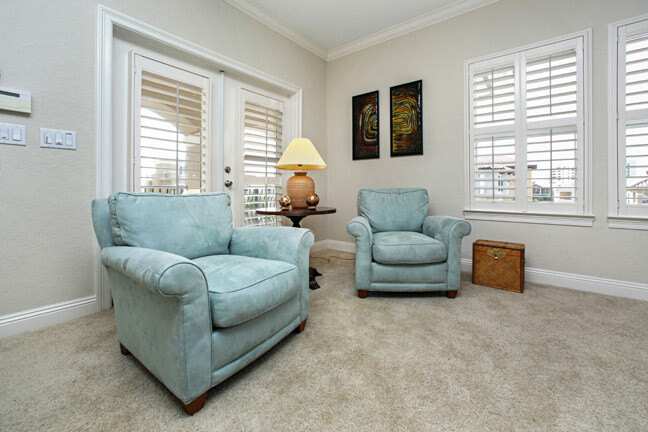 The living area has ample seating and a large Flat screen TV with 5 disc DVD/CD changer. 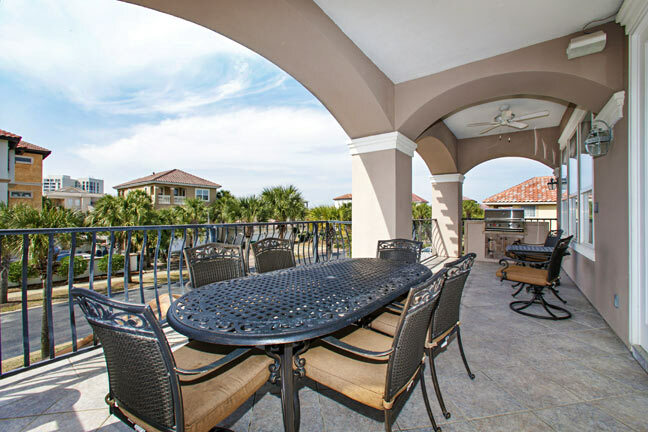 An expansive balcony lets you bask in the Florida sun, and hosts a natural gas grill for outdoor cooking. 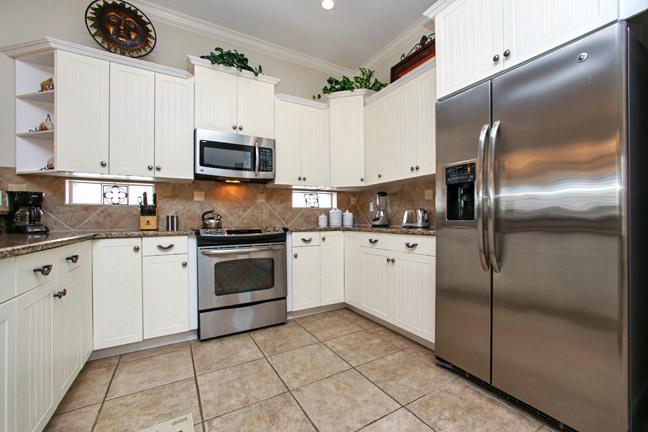 The fully-equipped kitchen features abundant granite counter space and stainless steel appliances including a stand-alone ice maker. 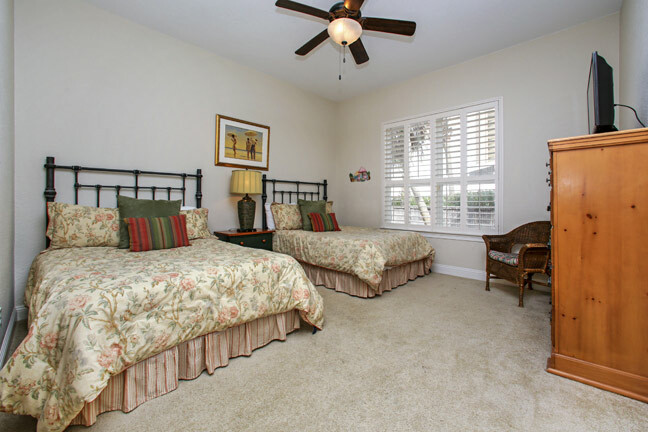 Located on the second floor is a guest bedroom with a king bed, flat screen TV, and full private bathroom. Also on this floor is a large laundry room with a full-sized washer and dryer, high chair, pack-n-play, and a half bathroom accessible to the main living area. The entire third floor is appointed to the king master suite. The spacious master bedroom has a seating area for two, flat screen TV, a wet bar and private entrance to the third floor deck. 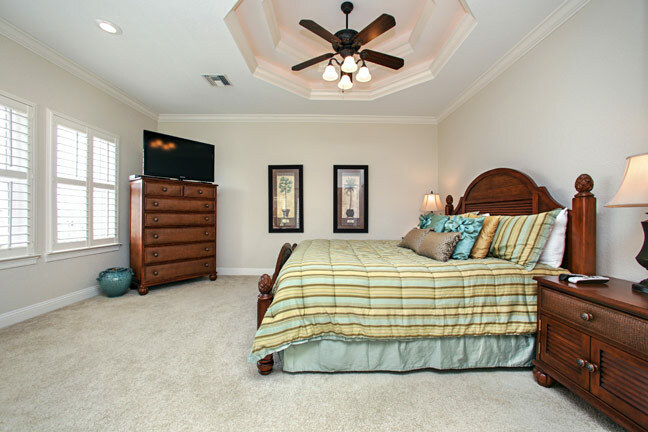 On your way to the master bathroom, you’ll pass the huge walk-in master closet and another double closet with floor to ceiling mirrored doors. 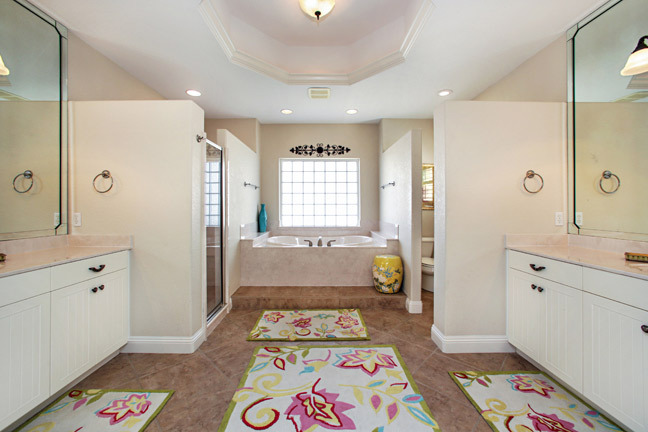 Soak your troubles away in the luxurious master bath jetted tub. The bath also features an oversized walk-in shower and two vanities with separate sinks allotting you plenty of space for getting ready. 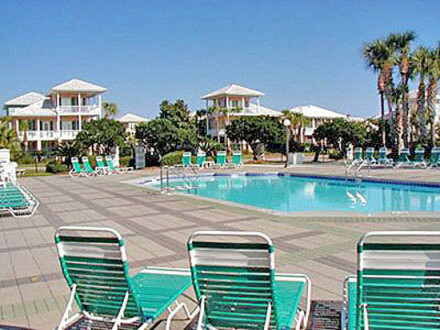 Summer Lovin’ in located in the gulf side gated community of The Dunes of Destin. 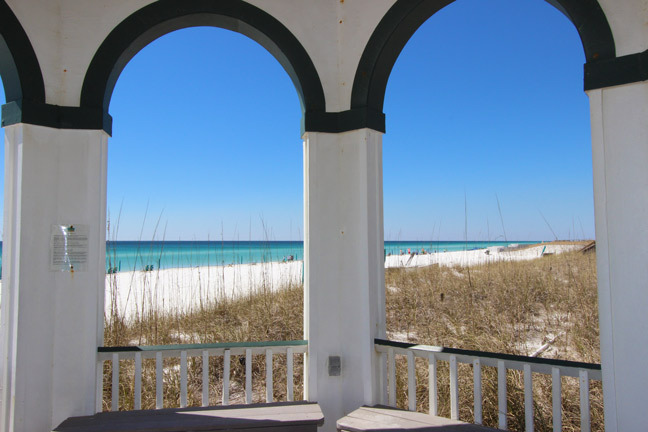 Featuring some of the most luxurious vacation homes on the Gulf coast, amenities include private beach access with gazebo, a community pool and a stunning lake with walkway, gazebo and beautiful fountains that are light up at night. 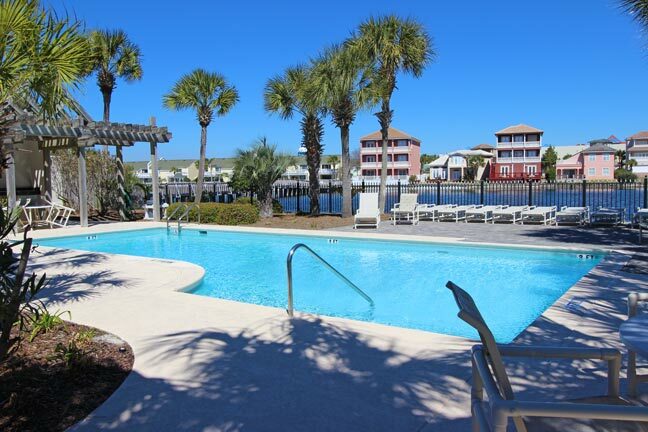 You are conveniently located in the heart of Destin and just minutes from everything the area has to offer with something for everyone in the family. Enjoy world class shopping (Harbor Walk Village, Destin Commons, Silver Sands Factory Stores and the shops at Baytown Wharf), award winning restaurants, beautiful golf courses and plenty of outdoor activities. 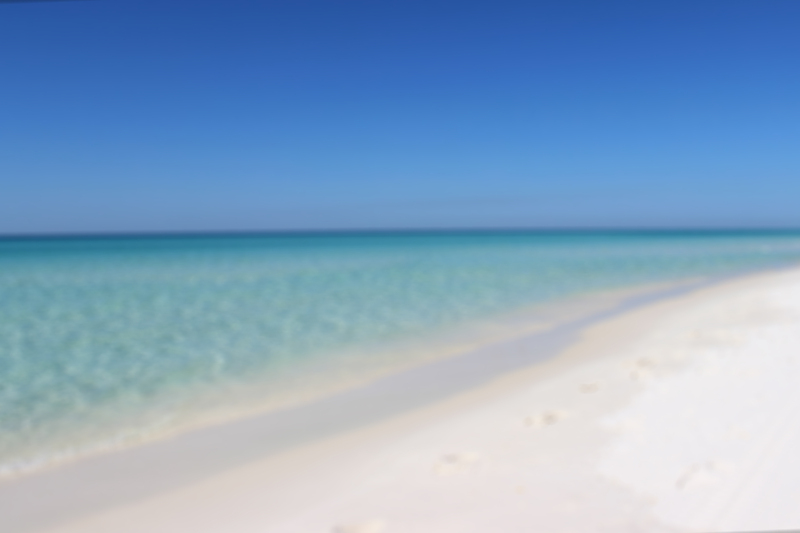 Combined with the luxurious homes and amenities offered, the Dunes of Destin is the perfect vacation spot. You’ll want to return year after year!